The new U.S. Mint sales figures are out and this past week looks like a return to normalcy after the surging numbers posted the prior two weeks (those reports are here and here). This week’s top sellers were the 2015 U.S. Mint Proof Set with 13,884 units sold, the 2015 American Eagle Silver Proof Coin, which moved 6,936 pieces, and the 2015 U.S. Mint Silver Proof Set, which posted 5,615 units sold. 2015 Mint sets are selling at an impressively steady rate. The 2015 U.S. Mint Proof Set’s total of 13,884 looks a lot like last week’s figure of 13,114; the 2015 U.S. Mint Silver Proof Set’s tally of 5,615 is almost identical to last week’s 5,547 total; and the 2015 U.S. Mint Uncirculated Set‘s total of 5,135 units sold comes close to repeating last week’s count of 5,243. 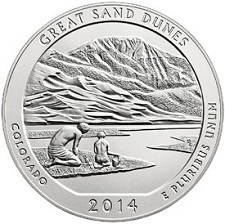 The 2014 Great Sand Dunes ATB 5 oz. Silver Uncirculated Coin is now sold out, with a final tally of 24,103 pieces (slight adjustments may follow). Its mintage limit was set at 30,000; the Mint has also sold 22,000 bullion issues of the coin. Sales for the 2015 American Liberty High Relief Gold Coin have slowed a bit as the item has been in “Unavailable” status for much of the week; it has sold 158 pieces since the last report. The following statistics show total sales for the listed items through November 9, 2015. The first numerical column includes information from the Mint’s November 2 report, the second column displays this week’s updated numbers, and the third column tallies the increase in sales over the last week. For more information on any of these items, visit the U.S. Mint’s online product catalog. So the 2015 Blue Ridge Parkway 5 oz silver is also sold out, with a relatively low sales figure of 17,482. I’m not spending another cent at the US Mint until it trims down its inventory. Looks like the ATB quarters sales just keep falling. Maybe 5 a year is just too much! They even stopped removing the oldest whenever a new one came out and now they are “selling” 8 at one time. Although the amount of sales of the 2014 versions is dismal. Will the s-mint version ever be worth something?